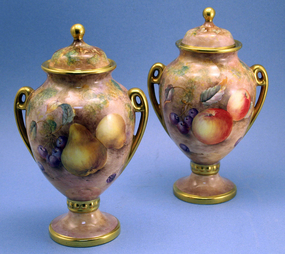 Modernist Italian Vase by Raymor with brown and orange body and leafage designs. Bottom retains the Raymor sticker. Exceptional Silver Cane decorated with the face of Medusa and a coiled snake, Hallmarked with a "R" inside a square and the number "925" inside an oval. 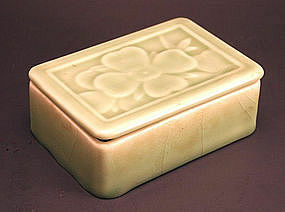 European, 20th Century. Large Rookwood vase with circular foot and flared rim and two bands of leaf decoration; in a tan glaze with impressed Rookwood logo, dated 1947, pattern #6894. 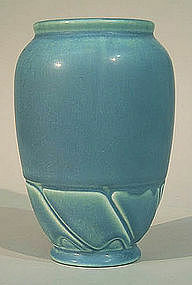 Rookwood matte glazed vase with wave-form relief decoration and impressed mark dating it to 1931. 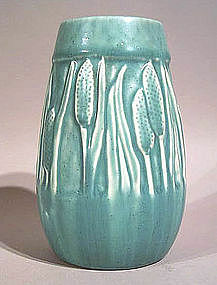 Rookwood matt glazed vase with relief decoration of cattails, with impressed mark dating it to 1926.